How many times have you woken up in the morning with Back and Neck Pain that you didn't have when you went to sleep? How many times have you noticed that if your Mattress is catering to the shape of your spine? Researches says that Mattress and Pillow play an important role in maintaining your posture while sleeping. If the Mattress sinks or is pushed up, either way your whole Back bends excessively, making the back muscles dysfunctional. In short term the muscles stiffen as a protective mechanism to support the back, but over a longer period, the same muscles end up markedly reducing the mobility of the spine. This leads to even further stiffened neck and back every morning. Hence the morning pain. Sometimes, there could also be pain, pins and needles or numbness radiating down the arms or legs. This is courtesy irritation of the nerves in the neck or the lower back. You spend a remarkable amount of your time on planet earth sleeping, approximately 6-8 hrs. That adds up to one-fourth to one-third of your day, or your life. What simply starts of as a simple protective mechanism to cater to a poor quality mattress and pillow, soon leads to medical conditions that can become debilitating if not managed well. As much as prevention doesn't sell, if you can, why not address it right now, yourself. Your well being is not of as much interest to anyone else but you. You better take care of it so you can have (more) loved ones. Your spine comprises of seven cervical (neck), twelve thoracic (upper and middle back) and five lumbar (lower back) vertebrae, before the sacrum and coccyx, which are yet again concave. 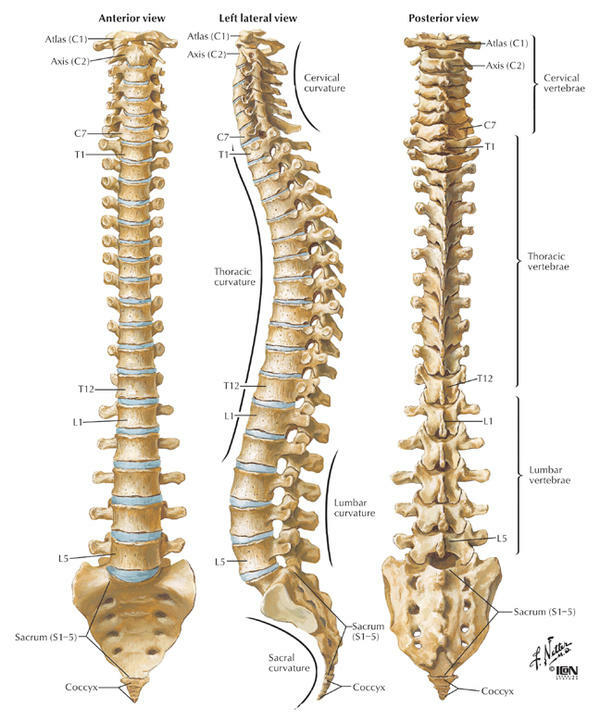 This spine is the chassis of your body. The one that holds the whole body together. The spine is S-shaped. From the front, cervical region is convex, thoracic region is concave to accommodate the heart, lungs, kidneys and such viscera, and finally lumbar region is convex again. Most experts agree that fetal position, the way shown by the baby above, is a better posture for sleeping. That doesn't mean you don't move and get into different positions while sleeping. Yes, you need to sleep like a log, but a log that keeps moving around. Anyways, no one posture is perfect for all. When you lie on your side, you need to maintain the straight line of the spine, the way everyone seems to be when standing or sitting tall. When you lie on your back, then you need maintain your S-shaped curves. Mattress should not be too soft or too hard. A good mattress and pillow should help you maintain a good posture while you sleep as well, addressing the contours of your spine, shoulder and hips whether you sleep on your back or your side. The illustration on top shows a poor sleeping posture where the mid-back is sinking in, which would make the pelvis to go out of alignment. This would pressure on the nerves in the lower back. The illustration at the bottom demonstrates how to maintain a straight spine. In pregnant women, the advice is to put a pillow under the side the lady is sleeping. In the above illustration on the right pillow addresses the neck, which is the correct way to do it. Almost always, as shown on the left illustrations above, the neck is ignored. A simple advice is to roll up a towel and put it in the pillow-case such that it then comes under the neck to support the neck and not let it sink. Remember, neck is the one that holds the head and the body together. Pamper it just a little and it'll repay back by not causing unnecessary pains when you get up in the morning.